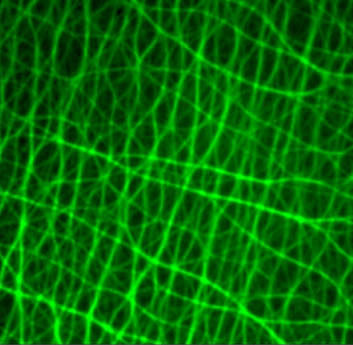 In the coming weeks I’d like to give you an overview of methods in actin research with validated R&D products and kits (actin polymerisation, and G-F actin ratio detection in cells); I also invite you to take a look at a post recently released about actin visualization: Focus on Actin staining and visualization. In today’s post, let’s concentrate on a method which allows measuring actin binding capabilities of proteins of interest. But it’s not only about the simple fact that a given protein is binding to actin, with the method presented here, you’re also able to get an idea of the functionality of the protein – be it F-actin bundling activity, F-actin severing activity or G-actin binding activity. Fig. 1: F-Actin Binding Assay. An F-actin binding assay was performed as described in Section VI Binding Assay (method 1) of the manual (centrifugation at 150 000 x g for 1.5 h). Samples of the supernatant (S) and pellet (P) fractions were collected for each reaction. Samples were separated on a 4-20% SDS-gel and stained with 0.1% Coomassie blue. Reaction 1, F-actin alone. Reaction 2, α-actinin alone. Reaction 3, BSA alone. Reaction 4. α-actinin and F-actin. Reaction 5, BSA and F-actin. Note how in the presence of F-actin filaments greater than 70% of the ABP α-actinin is found in the pellet fraction (4 P). In contrast, greater than 90% of BSA remains in the supernatant fraction when incubated with F-actin filaments (5 S). Cytoskeleton Inc., the recognised global leader in cytoskeleton and small G protein research reagents, optimized a method to measure actin binding which is based on a simple pull-down experiment. Actin binding occurs when there is an affinity for any site of actin. F-actin binding can be measured by using a spin down assay where centrifugation is used to separate F-actin from G-actin by differential sedimentation. F-actin binding proteins will co-sediment with actin filaments and form a pellet at the bottom of the centrifugation tube (Fig. 1). Fig. 2: Actin bundling assay usingCytoskeleton’s Actin Binding Protein Biochem Kit. 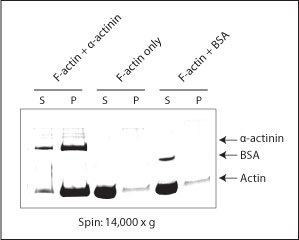 F-actin was incubated alone or together with α-actinin or BSA. Bundled F-actin was pelleted by a 14.000 x g centrifugation and pellets (P) and supernatants (S) were run on an SDS-PAGE gel. Only in the presence of the F-actin bundling protein α-actinin is actin pelleted at this centrifugation speed. Although simple in terms of experimental set-up, the methods allows you not only to detect actin binding of your protein of interest, but also gives you the opportunity to characterize your protein in terms of effects on the actin cytoskeleton.To measure actin bundling activity of your protein the protocol of the pull-down assay has to be slightly modified by pulling down bundled actin by centrifugation at 14.000 x g (instead of 150.000 x g). A typical result of the bundling activity of α-actinin is shown in Fig. 2. Furthermore, the detailed protocol of the kits contains a guide to interpret the results and to distinguish between severing or capping protein, whether the protein of interest enhances actin polymerizationan whether it is G- or F-actin binding and whether it exhibits actin depolymerizing activity. ABPs can be classified into groups of proteins depending upon their activity towards actin – some of these activities can be differentiated with the Actin Binding Protein Spin-Down Biochem Kits. These proteins bind to G-actin. Their major function is thought to be the sequestration of G-actin from the monomer pool and the subsequent prevention of polymerization. Examples of monomer binding proteins include profilin, thymosin and ABP-50. These proteins will be detected with this kit by sequestering a greater amount of actin in the supernatant and no test protein will be present in the pellet. These proteins cap one end of an actin filament and affect actin dynamics. The majority of capping proteins characterized so far cap the barbed (fast growing) end of actin filaments. 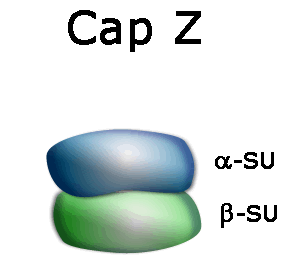 These include Cap Z and insertin. These proteins will reduce the polymerization rate of F-actin and therefore create a greater amount of actin in the supernatant and an F-actin stoichiometric amount of test protein in the pellet. Many of the proteins classified as severing proteins are also barbed end capping proteins. These include proteins in the gelsolin family. A severing protein that does not show a capping activity is depactin. 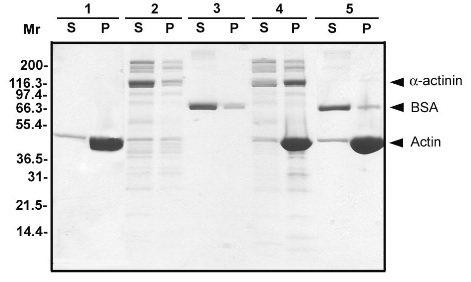 These severing proteins will result in more actin in the supernatant compared to the control, and the test protein will be present in the pellet. These proteins bind to the sides of actin filaments; they can be subdivided into two major groups, those proteins that bind to one actin filament and those that are able to crosslink filaments by binding to two filaments. The former group includes tropomyosin while the crosslinking proteins include α-actinin, fascin,and filamin. The bundling activity of these proteins can be assayed by actin co-sedimentation assays; bundling activity can also be directly visualized by microscopic methods. These proteins may cause actin to polymerize to a greater extent leaving more actin in the pellet compared to the control. The test protein will be present in the pellet. The actin cytoskeleton is intimately linked to the cell membrane where it is involved in cell locomotion and signal transduction mechanisms. The proteins that mediate this attachment include the ERM proteins and ponticulin. The activity of these proteins can be studied by actin co-sedimentation assays and in vitro reconstitution experiments. The test protein will be present in the pellet. These proteins are members of the myosin family; they include the classical muscle myosin, responsible for muscle contraction and the non-muscle myosins that are implicated in many cellular processes including cell motility, endocytosis and intracellular trafficking. Actin motor proteins are studied by ATPase assays and in vitro motility assays. Actin binding of these proteins is usually sensitive to the presence of magnesium and ATP and/or GTP, therefore removal these nucleotides will result in the motor proteins being present in the pellet. Are you interested to try the actin binding assay? Get in touch with me through the form below. My protein control itself is coming in the pellet fraction. When incubated together with actin, both protein and actin is mostly in the pellet fraction. What could be the reason? I did bundling assay also. Now protein control is in the supernatant fraction. When incubated with actin, both are coming in the supernatant fraction. In order to assist optimally there, could you tell us more about your experimental goal and design? Also, it could be interesting to have your contact details and lab so that my colleagues can contact you directly. I am trying to find out the biochemical interaction of FH2 domain of Leishmania major Formins. with actin. Right now, I am checking the binding and bundling capacity of these domains. Later, I will be doing various fluorimetry assays.